Herbert Andrew Hancock was born at home to a loving family in Clay Springs, Arizona, October 4, 1929. He passed away at home surrounded by a loving family in Gilbert Arizona on December 20, 2017. In between, he accomplished more and gave more than most people in several lifetimes. He married Ina Lorene Petersen on November 13, 1948, and they were by each other’s sides the rest of their lives except when he was in the Air Force and would be sent to different places all over the world for duty. He and Ina had four sons, who gave them four grandchildren, who in turn gave them two great-grandchildren as of this writing. Herb served in the Air Force for 22 years, achieving the rank of Chief Master Sergeant. He served in the Korean conflict where he was seriously injured and was sent to the military base at March AFB, California, for treatment. While there, he became a Rams football fan because the owner of the Rams would send a bus to the base to pick up the wounded airmen and put them on the sidelines where they could watch the games. He would remark, “They treated us like VIPs.” He became a devoted Rams fan for his whole life, and we’re sure he’s continuing that devotion where he is now. On his way home from the hospital after six months, the Greyhound bus on which he was riding crashed into a water-filled canal, and Herb received the Soldiers Medal for helping get people off the bus despite having a cast up to his hip. He and Ina and their sons, Brendon and Loran, then spent 3-1/2 years in Spain where he worked with B-47’s. Later, in Amarillo, Texas, he would work with B-52’s, then a move to Arkansas, where he served on a Titan II Missile crew for 5 years. While there, he was named Airman of the year. In 1968, Herb, Ina and their four sons came home to Arizona and he retired there from the Air Force in 1970. 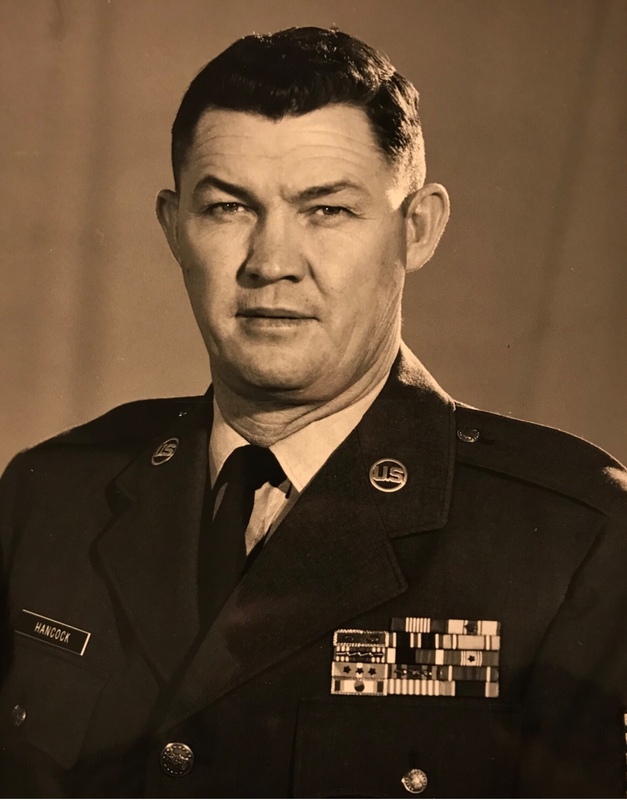 After that, he joined State Farm Insurance and served first as an agent in Safford, where the biggest trial parents can have, came as their son, Brendon Mike Hancock, was killed while serving a mission in France. We can just imagine the reunion the two of them are having!! He then went to Tucson as an Agency Manager, then to Albuquerque, NM where he was an Agency Director for the state of New Mexico. They then came back home to Arizona in 1994 and he served as an Agency Director at their Tempe headquarters until he retired in December 1995. After he retired from State Farm, he worked as a volunteer at Deseret Industries and the LDS Cannery, serving three two-year missions at the regional cannery, making food that was distributed all over the western US. All along the way, he helped both family and friends, often and generously. He figured the Lord had blessed him for a reason, and that reason was to help others, and he would not let the Lord down. He served in the LDS Church his entire life, including Group Leader in Zaragoza, Spain, Branch President in Jacksonville, Arkansas, assisting that congregation to build their own church, and again as Bishop in Tucson, assisting that congregation to build their own church. He also published two books, one about the Mormon Battalion and one about the difficult life of his great-grandmother. He leaves behind a legacy of kindness, generosity, and service. He will be missed by many. He is survived by his loving wife, Ina Hancock, his sons Loran, Garrett (wife Lilly), and Kyle, as well as grandchildren Angelica, Sabrina (Ian), Holly (Greg), and Daniel, and great grandchildren Ivy (Holly and Greg) and William (Sabrina and Ian). Funeral services will be held at 9 AM on Saturday, December 30, 2017, at the LDS Church at 2740 S. Lindsay Road in Gilbert, Arizona, followed by a burial at the Pinedale Cemetery (between Show Low and Heber) at about 3 PM the same day. In lieu of flowers, the family asks that donations be made to either Deseret Industries (www.deseretindustries.org/donate) or to the LDS Church Charities (www.ldscharities.org). So sad we only got this notice yesterday so we will not be able to attend. Cousin Bert was always one of our families favorite relatives. We are indebted to him for the wonderful work he did as an author of books and stories which mean so much to our family.